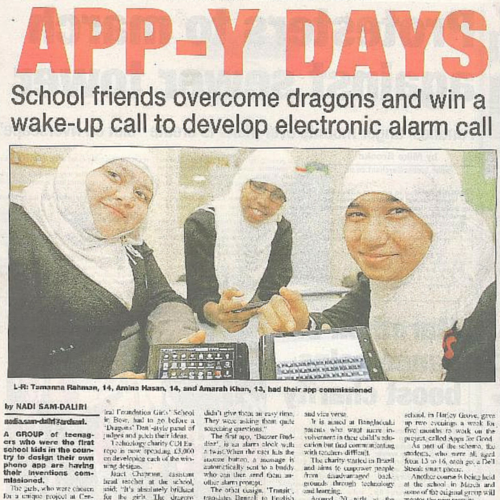 Tamanna Begum Rahman is an Apps for Good Fellow and the co-creator of the BuzzerBuddiez app. Below she shares her Fellowship journey, from idea to successful app and beyond! I was sitting and learning about algebra when I heard my maths teacher. He wanted to tell me about an opportunity to make an app – he thought I would be perfect for it. At first I wasn’t impressed. I felt intimidated and like I wouldn’t fit in. I didn’t own a phone or a tablet, so I didn’t understand the importance of apps. It wasn’t until after the extra curriculum co-ordinator suggested I do the course and I’d been sent several emails about Apps for Good that I signed up. Our groups were challenged to come up with issues that could be solved through an app. The amount of silly ideas our group came up with was ridiculous. One of my team mates finally said “imagine your phone snitching on you when you don’t wake up, and you get a call from your mum”. We couldn’t stop laughing, and with this idea, BuzzerBuddiez was born! A month went by, and we felt like business women with our market research and graphs. We decided to create an alarm clock with a double twist. The app would allow the user to set a recording and an SMS to help them wake up. At the Apps for Good Awards we had to present our idea Dragons Den style. We even presented to the producer of Teletubbies (*Eeeeek*). It was awesome, I felt famous when I was asked about about MY app. And then we won! When we won the competition we created our app with expert developers and designers, which was so exciting! Appearing in the media was also a shock. We had opportunities to appear on Blue Peter, do interviews BBC radio and BBC Asian Network and present our apps at fantastic events. Creating BuzzerBuddiez was a learning experience that I will never forget. It’s a great conversation starter. I’m currently studying a BA degree in Early Childhood Education and Care. When anyone views my CV the first thing they ask about is Apps for Good. Completing the Apps for Good course enabled my creative juices to flow, and improved my leadership skills. It’s also boosted my confidence loads. After getting use to speaking and presenting in front of developers, I can now present in front of a room of 450 people! I now videography, film editing and photography for events, wedding and parties. This was only possible after the Apps For Good team showed me how to edit videos. I can now proudly say that I make great looking films with my editing skills! Tamanna is an Apps for Good Fellow. Sign up for The Fellowship to access great opportunities and take your Apps for Good experience further! Next Help us celebrate our 5th birthday!